Environmentally friendly Ice Lined refrigerator powered by Meditech Technology for safe storage of vaccines between 2ºC to 8ºC. Temperature Backup – 72 Hours. Alarms – 12 Types of Audio Visual Alarm Real Time Clock Date and Time. 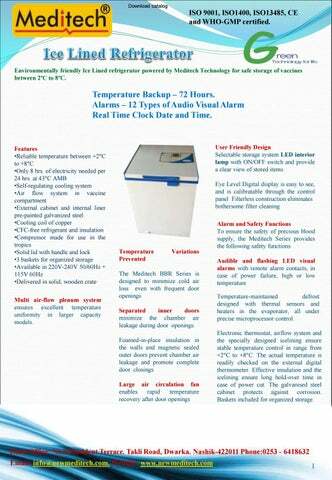 Features •Reliable temperature between +2°C to +8°C •Only 8 hrs. of electricity needed per 24 hrs. at 43°C AMB •Self-regulating cooling system •Air flow system in vaccine compartment •External cabinet and internal liner pre-painted galvanized steel •Cooling coil of copper •CFC-free refrigerant and insulation •Compressor made for use in the tropics •Solid lid with handle and lock •3 baskets for organized storage •Available in 220V-240V 50/60Hz + 115V 60Hz •Delivered in solid, wooden crate Multi air-flow plenum system ensures excellent temperature uniformity in larger capacity models. Environmentally friendly Ice Lined refrigerator powered by Meditech Technology for safe storage of vaccine between 2ºC to 6ºC . Meditech Refrigerators with Anti-Freeze technology ensure perfect temperature control with no risk of freezing. This LED is on when theController is in working condition. This LED is on when there is power failure. The Menu button is pressed to enter into MENU option. The Enter button is pressed to enter into â&#x20AC;&#x153;ENTERâ&#x20AC;? option. The Up Arrow button is pressed to go Upwards in the menu option. The Down Arrow button is pressed to go Downwards in the menu option. The USB is provided to connect the Refrigerator to the computer system.